Laura Milligan, Stampin' Up! Demonstrator - I'd Rather "Bee" Stampin! : Hey Chick! For my card today I used the Hey Chick stamp set from our Saleabration offerings. The Hey Chick stamp set is available for free with a $50 product order during Saleabration. 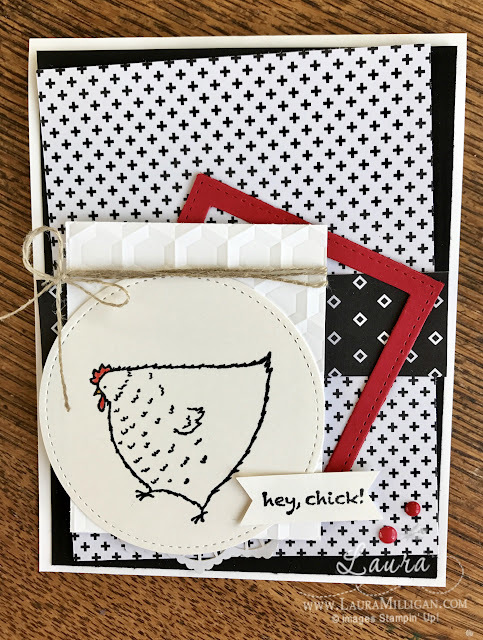 I am playing along with the TGIF Challenge today - and when I saw Birds of a Feather theme, this little chicken came to mind! My card uses mainly white and black with just a touch of red. The Designer Paper is from the Pop Of Pink package - love this paper! I started with a card base of Whisper White, and layered a piece of Basic Black over that. Next layer is a piece of the Pop of Pink Designer Series Paper- attached slightly askew. I used a different pattern of the Pop of Pink dsp and attached it as my next layer. I used two of the square shapes from the Stitched Framelit dies and cut them at the same time, creating a frame. I embossed white cardstock with the Hexagons Dynamic Textured Impressions Embossing folder, and wrapped some Linen Thread around the top and tied a bow. I attached this piece to my card with dimensionals. I stamped the hen on Shimmery White cardstock with Memento Black ink - and cut her out with a circle from the Stithced framelits set. I used watercolor pencils to add just a bit of color to the hen. To finish the card, I created a little banner with the Hey Chick stamp and attached to the card front, and added two Real Red enamel shapes. Tomorrow Stampin' Up! releases three new Saleabration products that can be selected for free with an order of $50. Yay! Below are the products used and cardstock cuts for my card. If you need stampin' supplies, you can order directly from my online store by clicking on any image. If you don't have a demonstrator I would "bee" pleased to serve as yours! Shimmery White 3 1/4" x 3 1/4"; Basic Black 4" x 5 1/4"; Real Red 3" square; Pop of Pink Designer Series Paper - 3 3/4" x 5", 1" x 4"
Thanks so much for your kind comment! I love the card you created with this theme!